Harvard University Press, 9780674983960, 336pp. The United States has two separate banking systems today--one serving the well-to-do and another exploiting everyone else. How the Other Half Banks contributes to the growing conversation on American inequality by highlighting one of its prime causes: unequal credit. Mehrsa Baradaran examines how a significant portion of the population, deserted by banks, is forced to wander through a Wild West of payday lenders and check-cashing services to cover emergency expenses and pay for necessities--all thanks to deregulation that began in the 1970s and continues decades later. "Baradaran argues persuasively that the banking industry, fattened on public subsidies (including too-big-to-fail bailouts), owes low-income families a better deal...How the Other Half Banks is well researched and clearly written...The bankers who fully understand the system are heavily invested in it. Books like this are written for the rest of us." 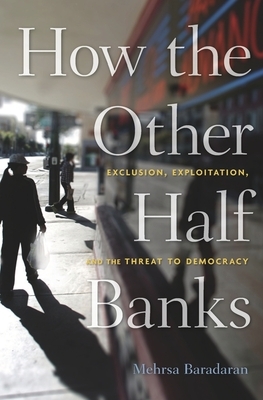 "How the Other Half Banks tells an important story, one in which we have allowed the profit motives of banks to trump the public interest."